There isn’t a day that goes by when I don’t make myself a cup of tea. I’m always trying out new brands and flavours, on a quest to find my perfect tea. My go-to tea has been Japanese Sencha loose leaf for years, but I like to spice things up once and a while. I recently fell head over heels for President’s Choice Chocolate Chai tea. It’s made from a lovely base of roasted chicory root, carob pod, with hints of spices like ginger and cinnamon. The price is very reasonable too; I think the tea bags work out to being less than 20 cents each. I find flavoured teas can be hit or miss, but this one is definitely a hit. In the morning, I stir in 1 cup of almond milk and 1.5-2 tbsp maple syrup. Sometimes I stir in 1/2 tsp of vanilla extract too. If your milk is already sweetened you might find you don’t need much sweetener. I’ve made this with many other flavours too, including regular black tea. I love to pour a glass first thing in the morning or as an afternoon pick-me-up. Much like vegan overnight oats, it’s really nice to wake up to! You can also pour it into a travel mug and bring it to work or school with you or on the road. It’s chocolaty, it’s creamy, and it’s so refreshing in this heat. What are your go-to summer drinks? Do you make any at home? What are your favourite teas? My other fav summer beverages include Iced soy lattes, green monsters, and other smoothies. I know I’m about a million years late to the latte party. 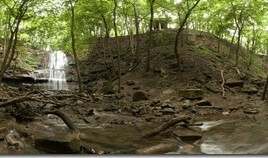 Here is the original shot before editing in Lightroom, cropping, and writing the blog name in Photoshop. 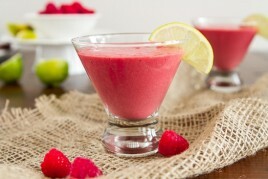 You can also check out my post on Chatelaine this week where I talk about two easy summertime smoothie recipes. Stay cool & have a great weekend! I LOVE iced white tea with honey. There’s this gourmet tea shop that I keep meaning to go to and stock up on the summery flavored loose tea leaves to brew. They have the most intriguing blends, like passionflower boysenberry and mango mint! Those teas sound amazing. It’s amazing what they come up with! I have never heard of chocolate ea before! This needs to be in my life, as I am a chocolate addict. Great new header! I love the cherries! Did you design it yourself? Thanks Laura, yup I made it yesterday. I’ll post a before pic of the header shot for fun. Love the new header! It’s so nice! I love to make iced green tea with fresh mint from my garden – very refreshing. Sparkling mineral water with lemon or lime is also a great thirst quencher on a very hot day. I love that you put basil in your purple berry basil smoothie. What a fresh take on the traditional smoothie. I don’t drink black tea, but I’m a fan of any variety of an rooibos infusion. There are so many varieties out there, I especially love the chai rooibos. I too add almond milk, & I like to sweeten with stevia. & I really like your new header. What’s the fabric you used underneath the cherries? It’s burlap :) Very messy, but I love it in photos! Very cool! Where do you buy that stuff? I drink mostly rooibos or mate teas these days. I have a chocomint rooibos tea that is just *divine* chilled on a hot, summery day! love the new header, great colour combo! I’ll have to forward this recipe to my Chai-addicted sister! I love the new blog header! Cherries are one of my favorite fruits and I love how you have been changing it up so often! I also love David’s Tea! So much so that I bring tons of it back in my suitcase with me when I go back to the UK. I drink Sencha all the time as well, but my favourite David’s Tea green tea is ‘Toasted Walnut’. It has such a nice sweet kick to it. Iced, I love the Luscious Watermelon and Goji Pop. And they have a great Chai selection as well. I pretty much love every one I’ve tasted so far though. It’s pretty addicting, haha. Love the new header but for some reason in my browser (chrome) Its all squished and distorted looking. Possibly still set to the same image size of the last header? Or maybe my browser is just wonky! Yikes, thanks for letting me know! I’ll see what I can do. It should be fixed now Sarah! Can you let me know if it looks ok to you? I also thought it looked distorted this morning but it looks fine now! I love teas with hints of chocolate in them! It makes them so rich a creamy! Love the new header too! fabulous idea for the tea, I’m not a coffee drinker anymore and all I see is iced coffee! I wish I prepped overnight oats last night, I’m really craving them now! Have a great weekend!! I live in Florida, where it’s extra steamy this time of year, and I love this idea! Plus, I really need to stop spending so much $$$ at Starbucks on my chai tea : ) Thanks for the tip! Love the new design, too! the header looks awesome although a bit distorted… but cute theme idea! cherries are perfect for the season, can’t get enough. Are you using Chrome by chance? The header should be fixed now in Chrome…can you let me know if it’s working for you? Thanks Katie! Love the header. Have a great weekend! ICED COFFEE. It’s the best thing in the world on a hot, humid morning. Love the new blog header. LOVE. There was cherry juice all over my kitchen last night, but my breakfast just rocked the house! Thank you! Yesterday I made lavender-chamomile iced tea with lemon. Two cups lavender tea (I steeped the buds), two cups chamomile, 2 cups cold water, 3 squeezed lemons and 1/3 c. raw sugar. I would have used liquid sugar, but I don’t keep it around. This was a combination of three lavender tea recipes I could find. And then I mixed it in sparkling water. And then I was in heaven. Have a great day and a fabulous weekend! Great new header! I will have to try that tea, I have seen it before but never picked it up. I love water with lemon and Stevia, smoothies with Vega protein, and iced coffee. Yum, I love the PC brand chocolatey chai! I never thought to chill it though, I always think of it as a hot drink. Gotta try this :D Your header looks great! I love tea, love chai. Need to try this brand. Love the glass too. This looks inconceivably delicious! I love your blog header – so pretty! you always have the cutest headers! this one is my favorite one yet i think! This sounds delicious! 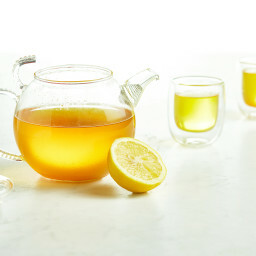 I love lemon-lavender tea and I make my own with organic lavender flowers and sliced lemon — it’s amazing! I love the new header, it looks great. Have you every tried Four O’clock Chocolate Spice Tea? Its fairtrade, 85% organic and caffeine free and it is one of my favorite dessert teas. It tastes great hot or cold with a splash of almond milk and since its caffeine free you can enjoy it in the evening on place of dessert. I don’t think I have but I will have to check that out! I agree: this is my FAVORITE tea! Available at Loblaws. I’ll have to pick some up. Bonus points for being available at Loblaws too! I also like Vanilla Nut Stash decaf tea, but the flavour isnt quite as strong as I’d hope. Love your website and the new header! 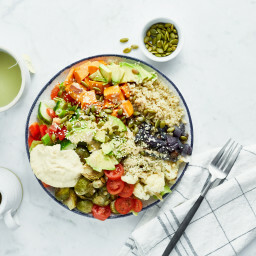 Thanks for the detox salad recipe!! I’ve been enjoying that often and I will have to try this tea, as well! I’ve been bragging about your site often! I appreciate it so much! Thank you!! Aw thank you Valerie, that means a lot to me! I am a FREAK about chai tea. Love, love, love it! i love the header picture but it looks distorted?? Hey Amy, Are you using Chrome browser by chance? A couple others said it’s distorted too, but it looks fine to me in Firefox and IE. No problem- for the record I just checked using my firefox browser (my default is Safari but I have Firefox as a backup) and it looked totally normal- it’s got to be certain browsers that are squishing it! Hey Amy, Yea I think that was the issue! The header should be normal in Safari and Chrome now. Can you let me know if it looks ok for you? Thanks! Glad it’s working for you now! Thanks for letting me know. I discovered that chocolatey chai tea this winter and I LOVE it too! Good idea to make it into an iced bevie — I never thought of trying that! And I love your new header. The cherry red with blue lettering goes great together! Great recipe, Angela! I love Chai, especially iced in the summertime, but I’ve only had vanilla and cinnamon chai before. The chocolate looks delicious. I adore the new header! It is very happy and summery! I am going to do this today – except I will use the tea I have in the house (Spicy Chai). I love making my own iced tea in the summer! I recently learned to add about 1/4 tsp of baking soda to the tea to cut down on the bitterness you sometimes find after the teas been sitting for awhile. It totally works! Really? That’s interesting! You don’t taste the baking soda at all? I also love the PC Chocolatey Chai tea. Have you tried the Chocolate Mint one too? It is also great. Thanks for the iced tea WITH MILK idea. I’ve made iced tea before, but for some reason I didn’t think to add any milk to the mix… I’m going to brew some right now and hope that it will be chilled enough in a couple of hours to enjoy. Did you say Chocolate mint? How did I miss that? That sounds right up my alley! So I have a somewhat funny yet sad story about that tea. I was all excited when I found it in the grocery store so I obvously took and pic and Instagramed it. I came home and unloaded the groceries and was super excited to make my chocolate mint tea. That’s when I discovered that I forgot to put it in my cart and actually buy it!! bahaha FAIL. I will have to go back!!! 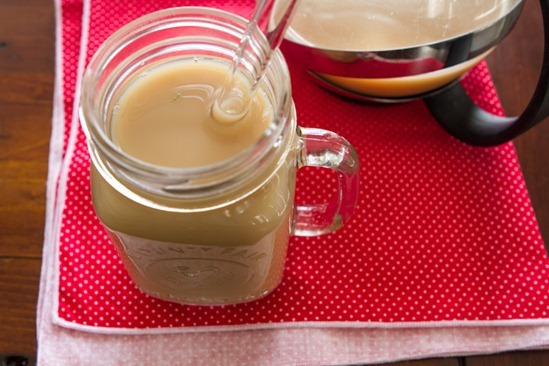 i know you said it’s not a recipe, but i really like the idea of waking up to cold tea in the mornings! and this version sounds incredible! Love the new blog banner. Looks so rustic yet fresh for summer. Hope you’re keeping cool with this heat wave we’re having in Ontario. Mmm chocolate chai- iced chai is one of my favorite drinks! I’ll have to make this. Love the blog header! 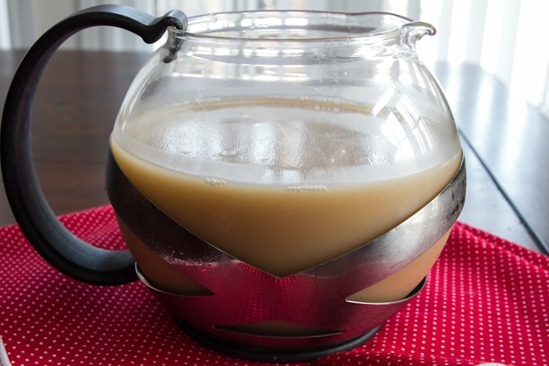 I have not had iced chai tea in forever – I used to make huge batches of it. Thanks for reminding me I still have about 6 boxes of it in my stockpile lol. What do you mean lightroom? Do you develop your film? Totally fascinated with your photography skills. Love the new header, favorite so far! Oh, I am such a coffee girl, I love tea but it just doesn’t get as much attention as my coffee. But Chai is my favorite, so I will have to check this out. I am going to have to try your chill method with some of my favorite teas that I cherish when it is cold outside. You do such an awesome job always Angela! Hi, did you leave the tea bags in overnight ?.. Btw love love love your site! Yup I sure did :) Love it strong! That tea sounds delicious! I cant seem to find how to buy some online, and I live in the US (their website says it isnt sold here). Any ideas? Hmm I dont think they sell it online unfortunately! It’s found in some grocery stores in Canada, but not sure if the PC line is carried anywhere in the US. Lovely idea – thanks! Where have you gotten the mug? Love that too! Great new header! Looks fine on my Chrome :) I love the PC Chocolate Chai too! Love the new blog header! Cherries are one of my all-time favorite fruits! I have Chrome, and the header looks great! Not distorted. I loved your last header….but I think I may love this one more!! Yum! Rishi makes an Organic Loose-Leaf Chocolate Chai that I LOVE, and am known to do the same with :) Though I like to do it Indian-style, warming the chai in the pot with the milk and sweetner, then straining out the leaves. Then I refridgerate and serve in a mason jar full of ice – no need to worry about the ice melting, I slurp it up too fast!! Thanks for sharing, I need to revisit this sweet summer treat! New header looks wonderful. Bought some of the Rishi today! Love it! I JUST made this and stuck it in the freezer. I used chai tea and added a bit of cocoa powder, put in the milk, and then a bit of fresh stevia instead of maple syrup. SO GOOD! Keep up all the good work, Angela! 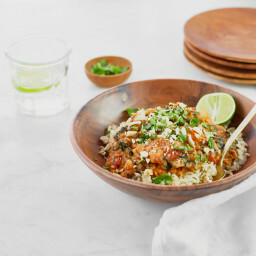 I’m only 15 but I love your blog and everything is so delicious…I am planning on making the lentil walnut loaf for my family this week and know it will turn out FANTASTIC! Sounds amazing! Beautiful new blog header! LOVE the new header (but then again, I’ve been a big fan of all of your headers!). I’ve been wanting to redesign mine for… ever? I just need to carve out the time to do it! LOVE the new header! Great job, Ange! 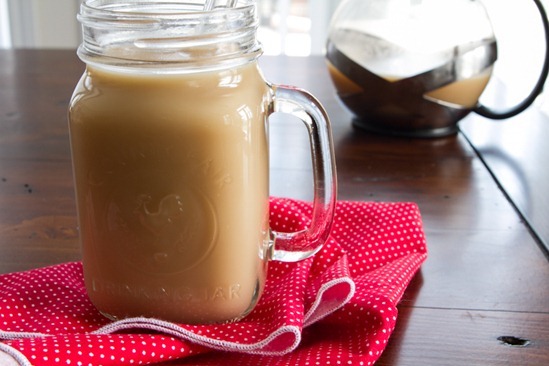 Summer = homemade iced coffee. It makes mornings wonderful! I put the coffee in a french press over night to cold brew it, then press the top down in the morning- voila! Delicious. I’ve heard of that method and Im dying to try it & use my press again. Maybe this weekend! Thanks for the link. No problem. It’s funny because I like hot coffee brewed rather than pressed, even though the french press is supposedly ideal for making good, strong coffee; but, for iced coffee I can’t beat it! Are there any Mac users who know how to get the new header up? I’m still not completely mac literate. Thanks! I rarely comment but I LOVE the new header. I made your blueberry shortcake pancakes this morning. I used light coconut milk in place of almond milk and they were delicious! The whole family loved them. Thank you for all of your lovely recipes. Hope you have a great Friday and weekend. Yum! I will have to look out for that tea next time i’m at the super store. The PC brand chocolate mint tea is also really good and chocolatey! This looks sooo freaking good! I love using mason jars as glasses, it makes everything seem cuter in my opinion :) Definitely buying this tea on my next grocery run. Love the header! So clean and fresh looking! since i loved your old blog header, i hated to see it go – until i saw the new one! perfect summer. I always squeal a bit when I see your name pop up in Chatelaine! And I LOVE the new header. The font especially is great! LOVE the new header! The cherry as the ‘O’ is just brilliant! And that tea sounds incredible… I need to remember to make tea the night before, because whenever I think of it during the day I always decide it will take too long to chill it. Will have to try that flavor, too, it sounds divine! That tea looks and sounds great! Unfortunately I can’t have caffeine so i’ll try and find a similar tea that is caffeine free. 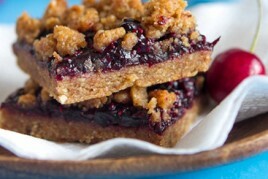 LOVE LOVE the new header….I’ve liked them all and those crumble bars…WOW! You amaze me with your talent…..
That tea looks incredible! I have been on a huge iced tea kick and would love a sweet and caffeinated way to start my morning. I have just started adding almond milk to my tea and I LOVE it! Thanks for sharing this idea! I would have never thought of picking this tea up from Superstore but now it’s added to my shopping list. This would be perfect to have after dinner on the patio. Love the new header by the way. The red cherries and color of the font is perfect! That looks fantastic! Perhaps this will be one of my new summer drinks. and of course Arnold Palmers. Oooo I must make some tea so I have it iced in the morning! The header is beautiful! love it. I am planning a trip to Vancouver/Whistler at the end of this month. I am compiling a list of great ingredients I can get there. Where did you get the tea? I also find it strange that you get quite a few items at a tire store. I know you are closer to the East coast, but do you have any recommendations on places to see or eat at? Chocolate Chai Tea :O Sounds like my two favorite flavours combined into one! I’ve tried PC teas before, but never found an outstanding flavor. The way you make it is so simple, and it still looks delicious. I’d definitely try it iced because I can’t go near hot drinks in the summertime. Loving the new header! 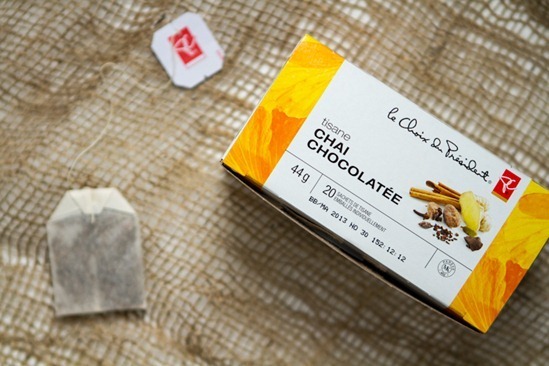 Okay, I’ve done a search, and for peeps in the US, it looks like ordering Adagio Chocolate Chai is the best we can do (and who knows if it would taste the same). Otherwise, I found one place that I can order the PC Chocolate Chai (which would be my strong preference), but the cheapest shipping regarding of whether one box or three, would be $16 — way too steep for me! Now I understand why Canadians get upset when they can’t find a US product with reasonable shipping… I vote for the giveaway, Angela!!! I love your new header! Very nice. Where can I get this tea at? I must know! I love that tea! I haven’t bought it in a while though. 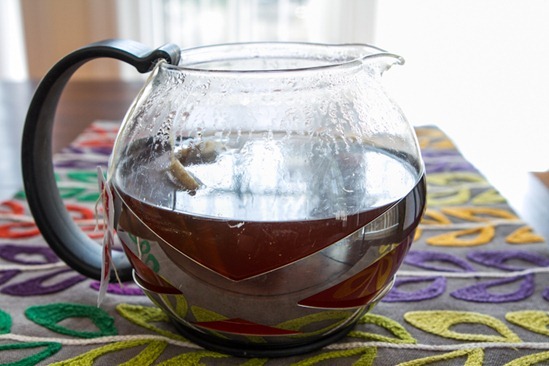 Right now I’m loving Yogi’s Egyptian Licorice tea – I’m totally hooked! I’ve been making endless pitchers of Tazo passion iced tea (it comes in big iced tea bags). I make it double strong and combine it with equal parts lemonade. So yummy and refreshing! mmmm that tea looks sooo good right now! And I LOVE the new header! Ohhhh that sounds good! I will have to find that tea! I do enjoy a nice, ice cold glass of tea but I am hooked on iced coffee at the moment. I love to add just a bit of sweetened almond milk to it. So refreshing! So glad to hear that, thanks!! Do you know where I can order this online? It sounds delicious and I would love to try some! I love doing this! I have several different brands/flavors I’ll have throughout the day. Right now, my fav chilled tea is plain black tea mixed with vanilla rooibos. I like it strong and use plenty of bags, and then add a little stevia after pouring in my work mug. Great post, I want to try the chocolate chai now! oh that sounds wonderful! i love tea too! love your new header!!! :-) And I just wanted to say thank you for all your great work and your regular posts & emails. Whenever I can I open and read them because I love your photos, recipes and personal stories! Thank you Marina, you are so sweet to say that! I’m so happy you enjoy them. Take care. Love the new header! I’m a cherry fiend!! All I can say is THANK YOU!!! You are so inspiring. I have made so many of your recipes. The kale glow salad was phenomenal and the blueberry jam lasted less than two days. I can’t eat gluten and so many of your recipes are friendly to my diet. I never knew what hemp seeds or chia seeds were or even what nutritional yeast was. You have opened up a wonderful new world. I just ordered some really cool glass straws too. Where did you get the tea pot? I love the style. Keep up the wonderful blog. I look forward to seeing what new recipe you have created. Sun tea! Place one family size luzianne tea bag in a pitcher of tap water. Set outside in sun for 2-3 hours. (I cover the pitcher with a salad plate.) Pour in tall glass full of ice. It’s also good if steeped in the sun with a sprig or two of fresh mint. Perfect way to cool off in Texas on a hot day. I love that idea…not sure why I haven’t tried it yet! Your teapot is so darling! Thanks Angela! I didn’t even know they made chocolate chai tea. I bought some today and iced it and it was DELICIOUS! 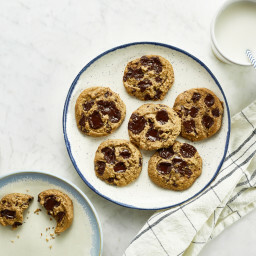 This is going to be a fabulous guilt-free treat. I love iced black mango tea with a splash of soy. We back it in a coffee shop and DC, and I just can’t get enough! I can’t WAIT to try this. Yummy! I love that tea as well! I was surprised to love a tea from President’s Choice so much, but there it is. Great idea to brew it overnight and have it iced. Thanks! Chocolate Rocket from David’s Tea in Toronto is excellent! It had a hint of rasberry & lots of delicious chocolate flavor. The vanilla rum flavor is also very good! Yet another recipe I’ve tried and LOVE. One question… I see these reusable straws in all your posts but I can’t seem to find them on the internet! Where did you get them?? love the new header, it’s just gorgeous! I’m in love! I think this will be my new warm weather beverage. I only have typical orange/black pekoe tea bags on hand but I couldn’t stop thinking about the chocolate part of this post. So I put one square of dark chocolate (chopped up) in my pot along with the tea bags and boiling water. It’s wonderful! Mm, that drink sounds super yummy – kind of reminds me of those tasty Bolthouse drinks. ^^ And I absolutely love your new header! I’m working on a totally new blog layout, myself. I love the new header. So pretty and perfect for summer. Cherries make everyone happy. Thanks for the tips about the iced tea. I’m a tea drinker too and sometimes it’s just too hot to brew a boiling cup. Love the tea pot! Where did you buy it? I made my tea last night and had my first taste this morning. Chocolate Chai perfection!!! I’ve always hated iced tea but I’m a convert now! Long time reader of your blog here and I was wondering if you could point me to some suitable recipes in your index for a picky/non-vegetarian man? My usual vegetarian dishes are too spicy/exotic for him (seitan, jalepeno infused mexican, goats cheese etc- all things he hates!) He is southern and likes mild bbq dishes and the only thing that was a hit with him have been my desserts + maple syrup bbq Tofu. Any suggestions for some kind of southern/bbq/mild vegetarian dish that will blow him away?! Mmm, Japanese sencha is one of my favorites too! The chocolate chai is a tea I would’ve never thought to buy (usually I’m not a fan of flavored teas) but how you prepare it sounds really, really good. And I’m also late to the iced latte boat – totally fell in love with them this summer when I accumulated a surplus of Starbucks gift cards. Can’t get enough bubble tea recently either! One of my favorite things to drink in the summer down here in hot and humid north Texas is infused water. I insert sliced cukes or different types of berries or watermelon in the infuser, then let it sit in the water for awhile…walah…ice cold fruity flavored waters. I also like fruit smoothies! YUM! 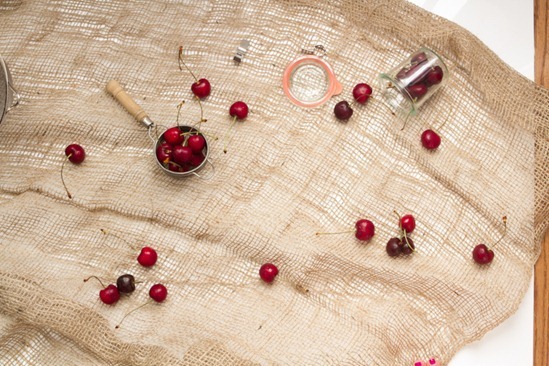 Lovin the new blog header, just bought 3 lbs of cherries for our trip this week. Love cherries! Yum! I made one today from chocolate earl grey (I think from Target, was a gift) and it was AMAZING. I can’t wait for breakfast to the rest that is waiting in the fridge. Thanks! This looks awesome and I want to try it!!! BUT I can’t find this tea where I am (Tyler, Texas) and tried to find it online but was not able to. Is there something similar you could suggest? Thanks!! Someone else mentioned another brand of chocolate tea in the comments section – I can’t recall the brand at the moment! I’m a milk tea fan, so I think I’m gonna love this tea you have here, very creamy. I’ve gotta try this one out. And oh! you’re header looks really great, perfect for summer. Looks amazing! Where can I buy this tea online? I am living in England now and don’t think I can get this brand in stores. (I am on an American base though, and can get US mail). Thanks! i bet if you throw some icecubes in it and throw it in the magic bullet you’ll have a divine iced drink like from Tim’s :-) only healthy….can’t wait to let my 14 year old try it. Chilled tea is wonderful. My favorite is to simmer a few whole cloves, cracked cardamon pods, half a cinnamon stick, & a couple slices of fresh ginger, covered, in water for about 20 minutes. Then I steep loose tea leaves in it before adding milk or raw honey. Last night I chilled it, then added hemp milk & vanilla. Perfect for after dinner snackiness. Maybe I’ll have to try a chocolate version. Iced mocha’s are my favorite to make in the summer! I buy Nestlé single serve instant coffe boxes. Take one of those bad boys, some cocoa powder, sweetener and dissolve in a few tablespoons of hot water. Mix with almond milk, add ice, straw, and enjoy! i’m delighted to have found you and adore your header. i’ve recently began feeding my body in a whole new way. first step was cutting out dairy and it’s made a huge difference in how i feel and look. 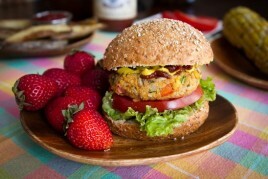 love your recipes and photo’s, so inspiring. We don’t have the President’s Choice brand here, but I found Guayaki Yerba Mate Mate Chocolatte tea and made it as you did yours. It’s really tasty. I like it any time of the day. I’m going to see if our local stores carry the Good Earth Cocoa Chai Tea also. Thanks for a great summer treat. I just wanted to let you know that this is actually a herbal tea, so there’s no caffeine in it! Which is great when you want a herbal tea that doesn’t taste like fruit or mint :) But it doesn’t do much for you if you want a pick-me-up (or maybe it does…the placebo effect is pretty powerful)! Very true! I guess the only thing stopping it from being free of caffeine is the cocoa. Maybe that’s why it’s not labeled as such. Is that a glass straw in your chai tea glass? Or a glass spoon? Angela, thank you for sharing about this tea. After reading your blog, I went right out and bought it, it is so delicious and smooth, I love it. My only question is if this tea is Gluten-Free? I’ve been diagnosed with Celiac Disease and I can’t find the answer anywhere. Hey Debs, Glad you enjoy it! Im not sure if its GF. I would try contacting the company for a confirmation. Take care! Love love love that you shared this! I’m going to go do this now so I’ll have it to wake up to. :) I don’t have chocolate chai tea but I will definitely be trying that. :) Thank you! Just tried this today …but a steaming version for ths crip Fall weather. Yummy, thanks for the tip about that tea! Used my magic bullet to froth the almond milk and sprinkled cinnamon on top. Delicious! Thank you so much for your recipes!!! Im 14 and a vegan (mostly any way ) and gluten/sugar free and probable couldn’t stay on track without your recipes. Okay so this may sound stupid, but how would I turn that recipe into a hot tea? Where I live it will stay cold for another two months and I can’t wait that long to try it out! Will it mes up my almond milk if I try to heat it up? Thanks! It’s a lovely recipe! I bought a PC’s chocolate chai tea today and i’m gonna try it tonight! Thank you for sharing this recipe! I really like your glass jar with a rooster. Can I know where did you get it? Good question – I think it was from a dish store in NYC! I can’t think of the name…fishy eddies maybe? Where do I find the President’s Choice Chocolate Chai tea? I am dying to try! Mmmm…this looks delish. Would coconut milk work just as well as almond? I am dying to try this, but can’t seem to figure out where to buy it. I’m having trouble finding it online even. Do you order it from a website?